WOW!!! Still as fantastic as I remember from 5 years ago!! Well done Wayne; Travis; Willie & Staff!! We had a memorable experience. See you again! Thank you. Family Söderberg from Sweden had a magnificent time at Alexander house! We will be back! Happy New Year! Camille, Patrick, Stella & Erik. It’s hard to say what I like most, the beautiful view, the lovely Jacuzzi or the perfect food: the homemade muesli, all the Breakfast is great! Especially the surprises from Travis. Thank you for all! Best, Best place!! “Heaven”! Everything you can imagine is catered for! 🙂 Travis & Willie are Superior hosts- Friendly, sweet, very accommodating & so willing to share their knowledge of Knysna too. We will definitely be back!! Very special part of our Honeymoon. Thank you guys!! Much love. To Wayne, Travis and Willy. Thank you for an amazing stay. Everything was perfect and we can’t begin to tell you just how impressed we are by your hospitality. Thank you for an amazing stay! Quite possibly the Hotel of a Lifetime. Our stay in The Royal suite has been exceptional. Not only beautiful surroundings with exquisite décor and every comfort for a great nights sleep, but also a complete attention to your ever need. It is difficult to think of anywhere else that would feel like utmost luxury but ultimately welcoming and homely at the same time. It’s not often we don’t leave a Hotel room!! Thank you all so very much! Amazing way to begin our lives as husband and wife… The experience at The Alexander House was second to none. Travis, Wayne, Willie, Memories and Cedric made our stay absolutely awesome! We felt so at home we didn’t want to leave – Thank you for the experience of a lifetime! 10 Stars for an amazing 8th Heaven! We’ll be back definitely! We can just say WOW!! !- to an excellent Guest House lacking absolutely nothing. Excellent service from each person working here. Totally relaxed! Thank you and god bless!!! Thank you for an amazing three days – a highlight of our time in South Africa. We are grateful to the attentive staff team caring for all our needs. Even a call to see hundreds of porpoise! Thanks to Wayne, Travis, Willie, Memories and Cedric for great service. We’ll be back the next time we’re in South Africa. We bless you all. I love the big Seahorse! I also found the Honesty Bar very accessible! 🙂 The views are stunning! All the staff were delightful and wonderfully friendly. I will be recommending The alexander House to everybody in Scotland! Stunning Hotel with the most spectacular views! Phenomenal service and such friendly, welcoming people. We will most definitely be coming back again :). Thanks for making my first visit to Knysna so memorable. No words, except: “DREAMS WERE EXPERIENCED.” Supreme luxury, attention to detail and professional service. Thank you. HAPPINESS THERAPY 🙂 Thank you for all! Thank you all for a nice welcome. It’s amazing to be here in a very luxurious home. A fantastic and wonderful selection to choose from at Breakfast on the terrace with beautiful views. We love all the decoration-Wayne!! We love Memories and the laughter. Hope we’ll come back soon. All the best for all the staff – Travis – Thanks for organizing our Golf things – Willie, Wayne & Memories. 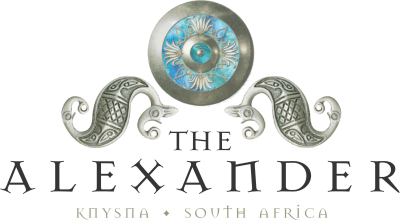 Staying at The Heads in The Alexander is a step near to Heaven, and it is Heaven. Everything is perfect, in our minds it is the best place to stay in this part of the world. We will be back soon and look forward to returning. Many thanks to Wayne, Travis and Memories. A nice experience in Knysna for us. The best room in our travel life! Thank you. See you again next year. Breath taking views, excellent service, perfect staff, great Breakfast, outstanding recommendations for Dinner and trips….and the best: The Honesty Bar and its Amarula 🙂 Perfect holiday, thanks to all! See you very soon! Dear Travis, Memories & Wayne, this surprise location is mind boggling, out of this world! We enjoyed every moment, the rooms and suites are beautiful and the views superb – not to mention the Breakfast. But most of all, the warm welcome and personal attention of the entire team. Baie Dankie, Merci.